for a little creative fun. with what is known as antimacassars. It is an odd word with an interesting history. Macassar oil was a tonic for the hair commonly used in the early 19th century. The fashion for oiled hair became so widespread in the Victorian and the Edwardian period that housewives began to cover the arms and backs of their chairs with washable cloths to preserve the fabric coverings from being soiled. In 1852 these started to be known as antimacassars. They came to have elaborate patterns, often in matching sets for the various items of parlour furniture; they were often made at home using a variety of techniques such as crochet and tatting. Place the antimacassar along the edge of the sleeves hem. Carefully hand stitch it down along the outside edges of the design to keep it in place. consider replacing them with your favorite vintage buttons! 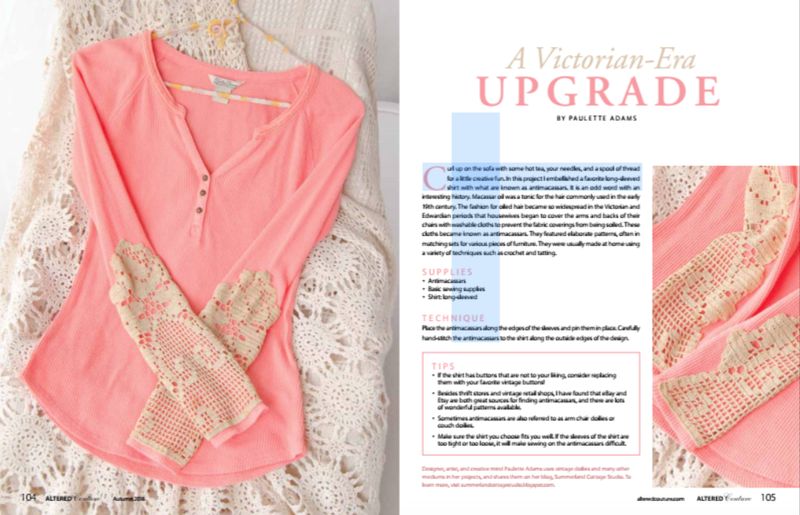 Grateful to share the creativity in Altered Couture Magazine!